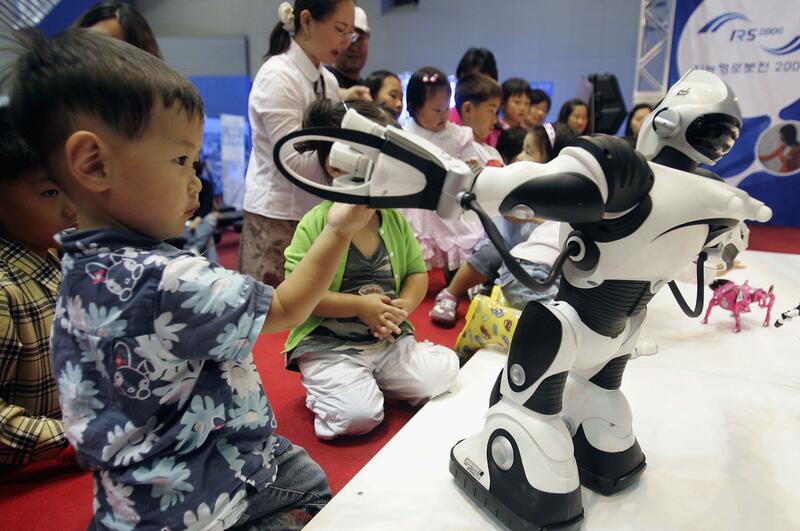 AI, robots could babysit children if liability can be settled. Kids love robots. But will they listen when a machine tells them to eat their vegetables? The movie invites us to consider the intimacy of our relationships with devices. How much emotional trust do we place in them? AI can’t currently engage in the intimate conversations that Theodore and Samantha have. But we’ve started to see smart machines that can help look after older patients and babysit kids. Will we soon rely on artificially intelligent robots to nanny our kids while we go to work, run errands, and have a date night? This could create some confusion over who has custody of the children. Although teenagers would hate to think of themselves this way, the law generally assumes that minors are always in someone’s custody. They wake up in their parents’ custody, go to school and are in the custody of the school, go to an afterschool program and are in the custody of the adults that run the program, get picked up by their grandparents and are in their custody, and finally return home to their parents’ custody again. At each stop during the day, the custodial adults are obligated to exercise reasonable care to ensure that the child neither hurts anyone nor damages any property. As any parent can tell you, “reasonable care” does not ensure that kids won’t whack another child or smash a window. But there is a difference between the little girl who breaks her arm because she fell off her bike while the nanny watched from 10 feet away and the little girl who runs into traffic because the nanny negligently ignored her for an hour while texting. A custodial adult who is negligent in watching a child will be found liable for any damages the child causes because of that negligence. Duration of the responsible adult’s absence. The parent who runs out to get milk while leaving a relatively mature 10-year-old with a well-regarded Samantha-type system has acted more responsibly than the parent who leaves for the weekend while leaving their newborn with an untested prototype of a Samantha-type system. In situations in which parents have acted reasonably in leaving their kids with a robot, liability may rest with the manufacturer, particularly if there is flaw in the design or production. However, as with two autonomous cars that operate properly but still crash into each other because of the circumstances in the road, it’s possible for a robo-babysitter to behave exactly as designed and still permit children to hurt other people or damage property. If there is legislation in the future, the writers might want to consider requiring minimum insurance coverage for autonomous devices intended for childcare in order to limit confusion over liability. Promoting the development of artificial intelligence devices and programs that work with kids should be a goal. Regardless of their babysitting skillsets, robots can be a tremendous asset in classrooms. For example, Maja Matarić, a computer science professor at the University of Southern California, has studied how interacting with robots is beneficial to autistic children. “Robots are very helpful to enhance the concentration capability of children in class,” notes Bum-Jae You, the head of the Cognitive Robotics Center at the Korea Institute of Science and Technology, where researchers are exploring the placement of robot teaching assistants in South Korean classrooms. You also says, “Children feel the robot is their friend.” So it’s possible that Her isn’t very far off the mark.